The storefront. Imagine it completely crowded out front. Ok, I am just going to say it: I do not understand the wild popularity of Good Enough To Eat. This is not the first time I’ve missed the boat of something others consider to be spectacularly awesome, and swoon-worthy. But week in and week out one of the longest lines for brunch on the Upper West Side is at Good Enough To Eat, and each time I can’t figure out why the folks are waiting so long. Most sucker-like of all, every now and again I get tempted to follow the herd and check it out to see if my previous impression was wrong. It never is, and wasn’t again. This is a Wednesday lunch? Now before you think this is a complete slam on Good Enough To Eat, don’t. The place is fine, just fine. But it gets it right in its name: the food is good enough to eat, in fact it is probably better than that, but certainly not so much better that it justifies the hellish lines. I just don’t get it. 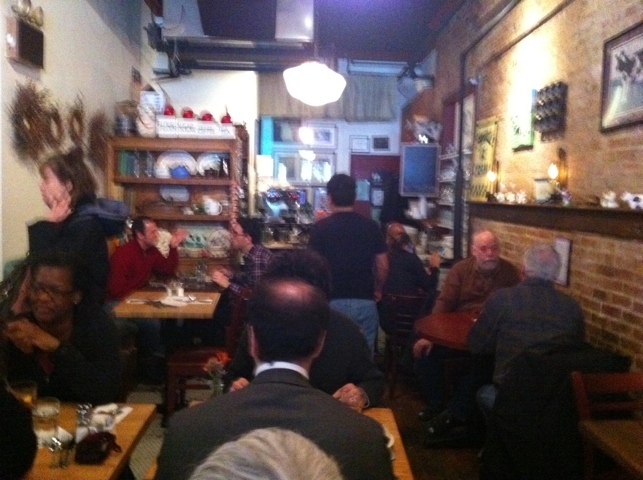 Even for a midweek lunch, the place was crowded. I keep wondering what their secret is. It’s not the price: the place ain’t cheap. Something like $10 or so for most of their breakfast fare (they are known for their breakfast comfort food staples, like pancakes and waffles and such). Narrow corridors between tables = bumping. It’s not the decor, which is frankly cramped and filled with tippy small tables and bumpy passersby trying to get past other customers’ chairs. It’s not the service, which was certainly pleasant and basically attentive but isn’t spectacular. In fact it took quite a while for our order to land at our table, which was left sans snacks or bread or such, so I wouldn’t suggest you go very hungry – especially if you also had to wait on the weekend line. Then again, maybe that’s their secret: hunger is the best sauce, so they say. So if it’s not price, service or decor, how come the place is so popular? Its gotta be the food, right? So how is it? Exhibit A. Do they look suspicious to you? 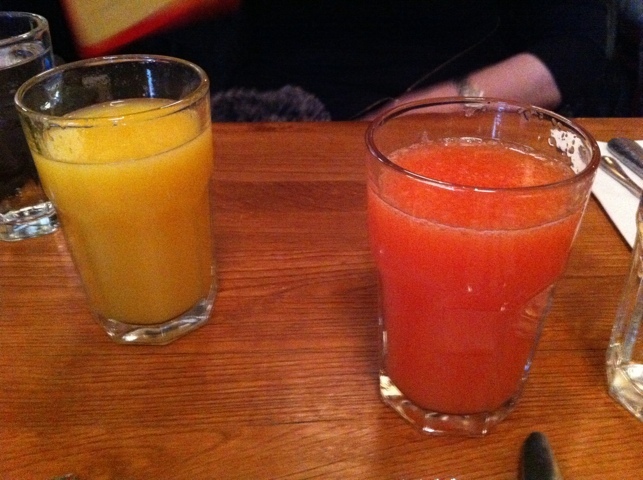 We ordered some fresh-squeezed juices. My wife took a sip of hers and right away knew something was up. Was it squeezed on premises, she asked. Nope. Now to me that’s not a big deal, but it does seem like a bit of a shortcut. If I buy a bottle of fresh-squeezed juice at the supermarket, keep it in the fridge for a few days, should I still be selling it as fresh squeezed? I don’t know if that’s what Good Enough To Eat does, nor am I suggesting that, but I do know if it was squeezed right then and there you couldn’t even ask the question. I ordered the Farmhouse Breakfast ($10.25). 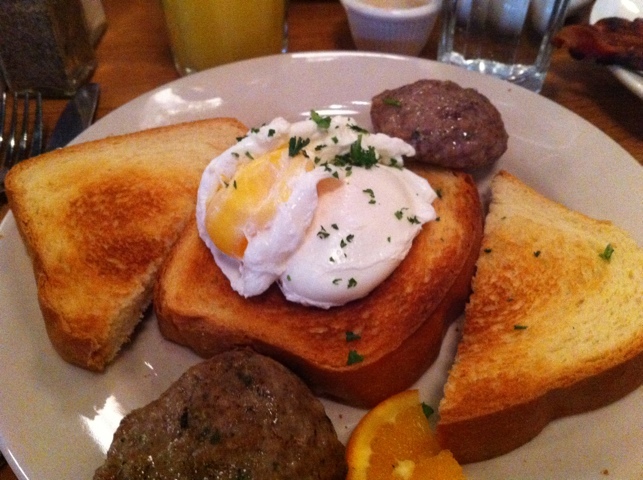 It consists of two poached eggs atop what they called home-made dill-onion toast and two pieces of home-made sausage. It sounded very good to me, and for the most part, it was. 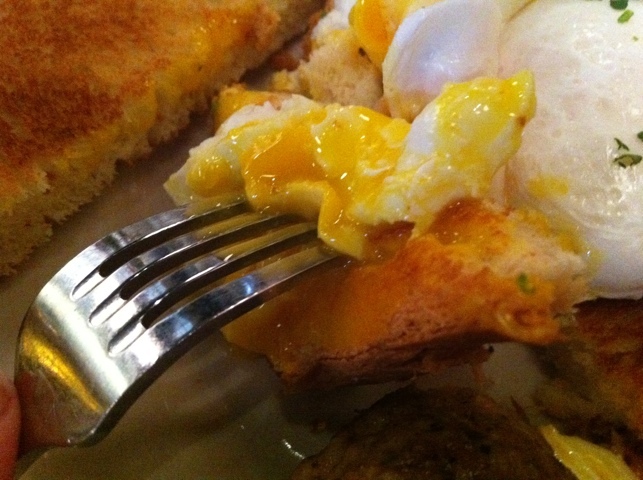 The poached egg. One was a slight touch overdone... . It eventually arrived at our table, and as you can see it was very well presented. The home-made bread essentially resembles a thick cut of fluffy white bread. The bread’s flavor was very sweet and rich, quite like challah. The dill and onion flavors weren’t noticeable to me. The egg was suitably runny, though one of them was slightly overdone and the center had somewhat solidified, but just barely. The eggs and toast together were lovely. 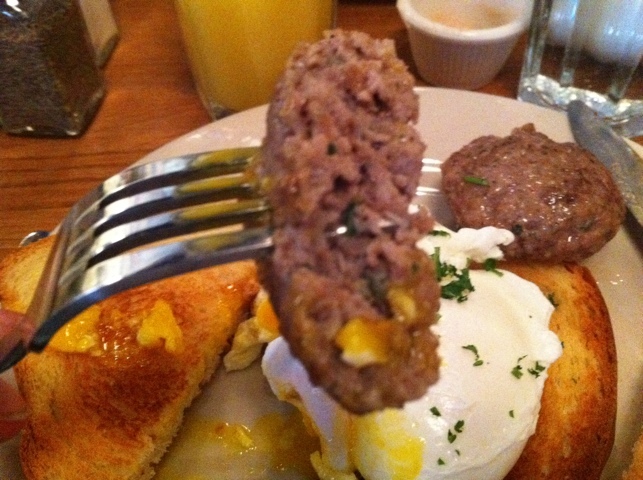 The sausage was essentially a proper, old-school meatball. It too was very rich. My wife opted for her favorite at the place, the waffles. 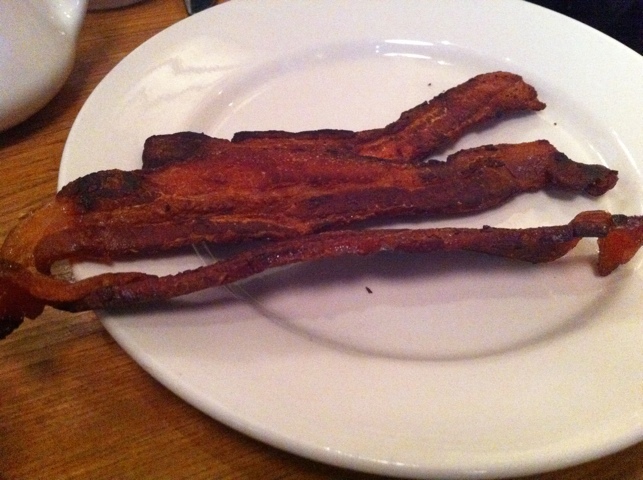 We ordered a side of crispy bacon for the table. 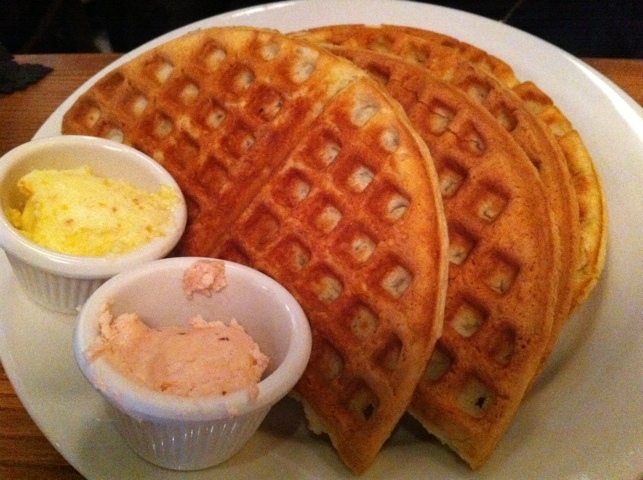 Melted strawberry butter, fresh maple syrup... . 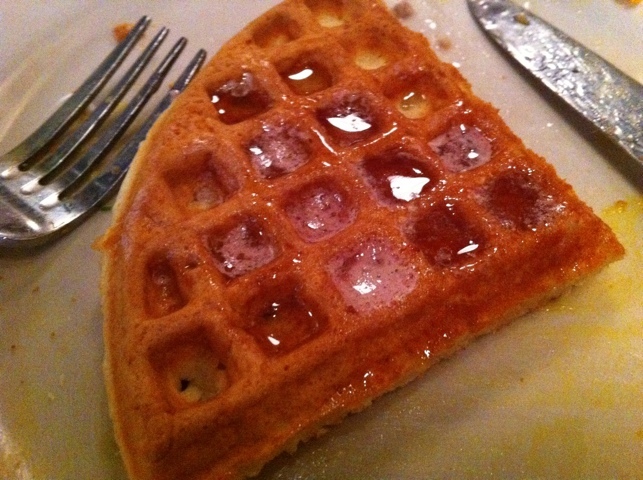 The waffles are served with a signature of Good Enough To Eat, a mixed butter. In this case, I think it may have been strawberry butter – or possibly orange – but it is winning. Unfortunately, the waffle itself was a touch heavier and chewier than you think it should be, especially once syrup was added to it. It is a plentiful amount of bread, so be warned. Crispy bacon. Overcooked as far as I'm concerned. The crispy bacon I found to be overdone. It had all the life cooked out of it. One can reasonably argue that by ordering it crispy, we were asking for trouble, and that would be a fair point. I am a fan of non-crispy bacon, but the wife likes it that way, so you do run the risk. 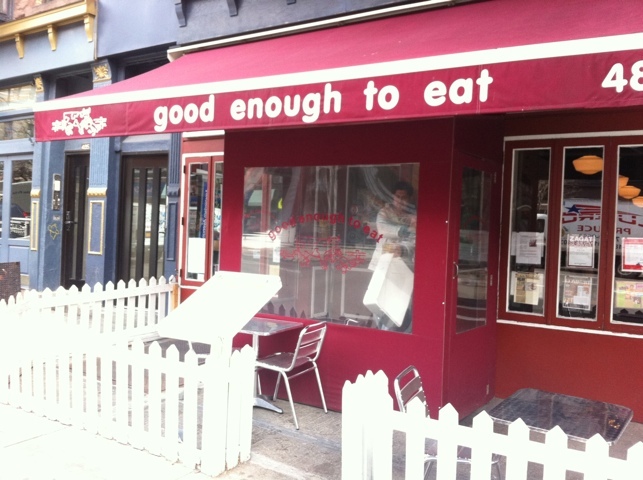 As you can probably tell, I basically like the food at Good Enough To Eat. It lives up to its name. But for the life of me I can’t figure why some folks line up endlessly there on the weekends. Barney Greengrass is just a few blocks away, and I would certainly understand why someone might wait a long time for that. Luke’s Lobster is just across the street! OK, so you don’t get to sit down, but you could be eating something spectacular. 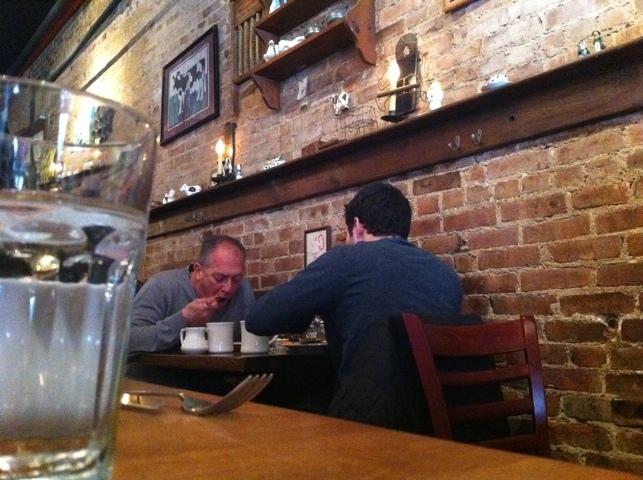 Artie’s is just a few blocks away, so is Popover, Alice’s Tea Cup and so on… why are they so committed to this cramped spot? It’s good enough to eat, not great enough to wait on line.